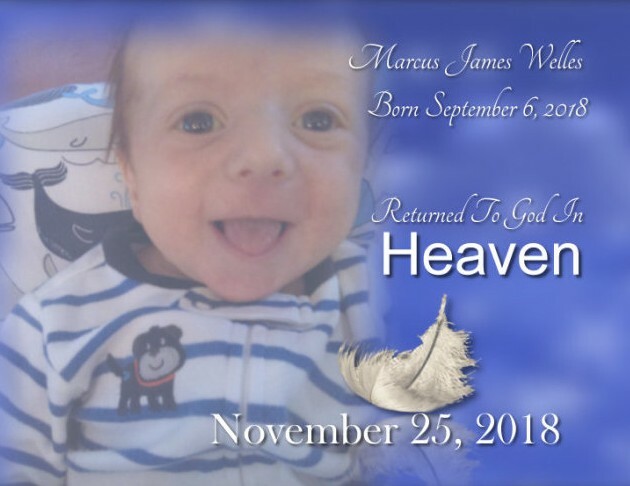 Obituary for Marcus James Welles | Kenworthy Funeral Home, Inc.
Marcus James Welles, two months old, of Hanover, PA, was called home to the Lord, Sunday, November 25, 2018 at the Children’s Hospital of Philadelphia with his loving family by his side. He was a gift to his family, and although his time on earth was brief, his memory will be everlasting. Marcus touched the lives of his loved ones and all who knew him. Born September 6, 2018 in York, PA, he was the infant son of Matthias H. and Jamie D. (Boardman) Welles. Marcus is also survived by his sister, Emily E. Welles; brother, Matthias H. Welles, II; maternal grandparents, Deborah Hodges and husband Lindel, and Robert Boardman and wife Reida; paternal grandparents, Charles F., III and Marilyn Welles; aunts and uncles, Krista L. Moore and husband John, and Charles F. Welles, IV and wife Elisa; and nephews, Levi C. Moore, Charles F. Welles, V, and Jack D. Welles. A funeral service will be held 4:30 PM, Friday, November 30, 2018 at Grace United Methodist Church, 55 Albright Drive, Hanover, PA, with the Rev. Stephen Salisbury officiating. A viewing will be held from 3:30-4:30 PM, Friday, November 30, 2018 at the church. Private burial will be in Wyalusing Cemetery.